Crews lift the Delta 4-Heavy payload fairing into place at Space Launch Complex-6 on south Vandenberg Air Force Base. 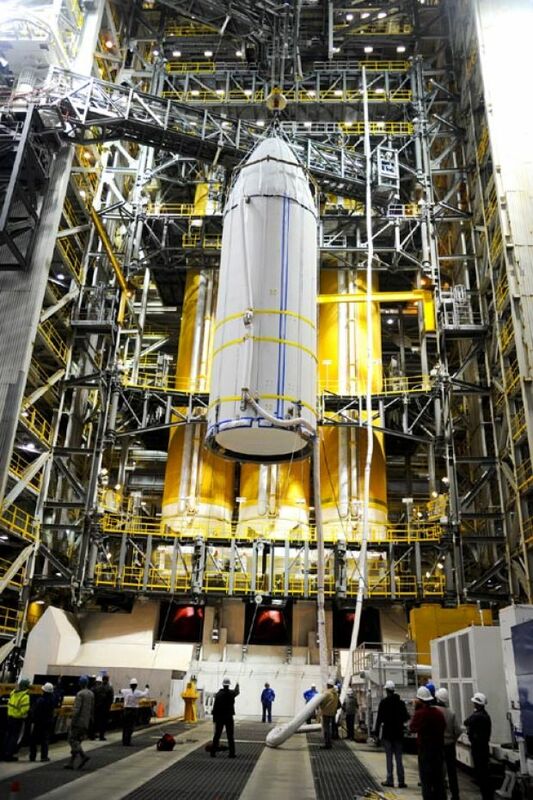 A monstrous rocket aims to make its second departure from Vandenberg Air Force Base on Wednesday, a launch date that has remained firm even as crews wrestled with scheduling challenges caused by sequestration. The Delta 4-Heavy rocket’s blastoff is planned between 10 a.m. and noon Wednesday from Space Launch Complex-6 on South Base. The former space shuttle launch pad is tucked in a canyon and isn’t visible from around the Lompoc Valley. The booster, topping 230 feet tall and built by United Launch Alliance, will carry a top-secret spacecraft into orbit for the National Reconnaissance Office. “Right now, there are no major issues that we’re working or that are threatening the launch,” said Lt. Col. James Bodnar, who took command of the 4th Space Launch Squadron in July. The days leading up to launch are busy with assorted reviews at various levels to ensure the rocket and its payload are ready for liftoff. Setting — and keeping — a launch date months or years ahead of time can prove challenging. But the Delta 4-Heavy team has wrestled with a new wrinkle for this campaign. For six weeks in July and August, key Department of Defense civilians were restricted to working just 32 hours a week due to federal furloughs as part of sequestration cutbacks..
Airmen primarily make up the 4th Space Launch Squadron, but a civilian is serving as Air Force launch director for this mission. “We had to be very careful, and sometimes creative, to make sure that all the operations were covered and all major meetings and other milestones were covered,” Bodnar said. More so than other missions, they relied on the deputy Air Force launch director — an Air Force officer — to cover some of the meetings. In some cases, they had to schedule chores to avoid weekend work or furlough-related down days for some contractors. Across the team of military, civilians and contractors, a blastoff is a momentous occasion because of the hard work that goes into making the mission occur. “Launch isn’t just something that happens on launch day,” Bodnar said. Along with installing the rocket and payload, the team conducts multiple exercises and tests. 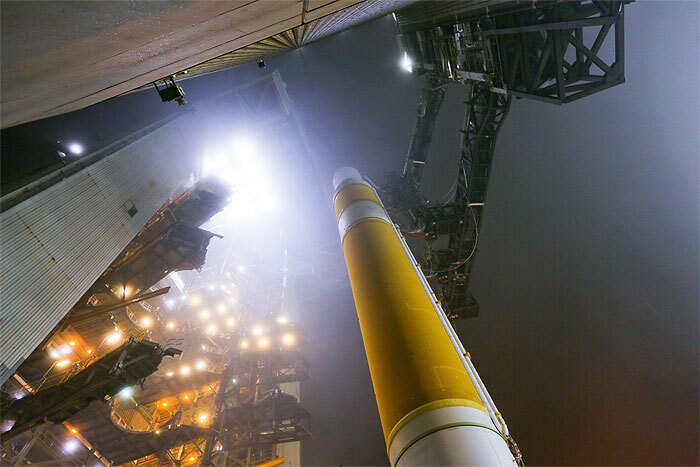 This will be the second Delta 4-Heavy launch from Vandenberg. The West Coast’s inaugural Delta 4-Heavy launch in January 2011 didn’t rattle the Central Coast as some spectators expected. “There’s nothing bigger that the United States launches — period — in any way, shape or form, and that is absolutely amazing. However with new technology comes some efficiency ...,” Bodnar said, noting it can’t be compared to the retired Titan 4 or space shuttle, known for their loud rumbling upon liftoff. 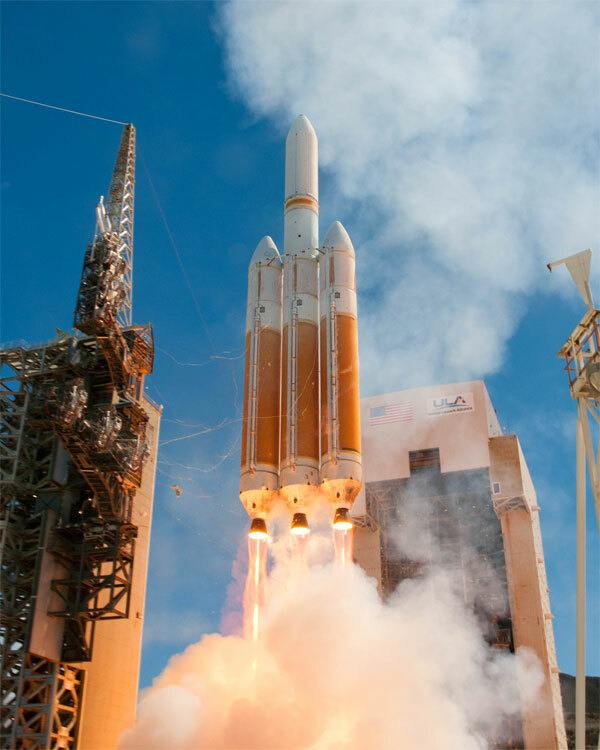 “The Delta 4-Heavy with its liquid oxygen and liquid hydrogen engine burns incredibly clean, is remarkably quiet for the size of the rocket and does an incredible job of reducing the vibration and the noise that the payloads actually see as we launch these into space,” Bodnar added. Delta 4 is designed with a Common Booster Core as its heart, topped with a second stage and payload. But the Delta 4-Heavy employs three Common Booster Cores strapped side by side. At 150 feet long and 17 feet in diameter, each Common Booster Core is the size of a Boeing 727 fuselage, United Launch Alliance officials note. The 235-foot-tall rocket produces 2 million pounds of thrust at liftoff, the power equivalent of 33 Hoover Dams, ULA officials added. 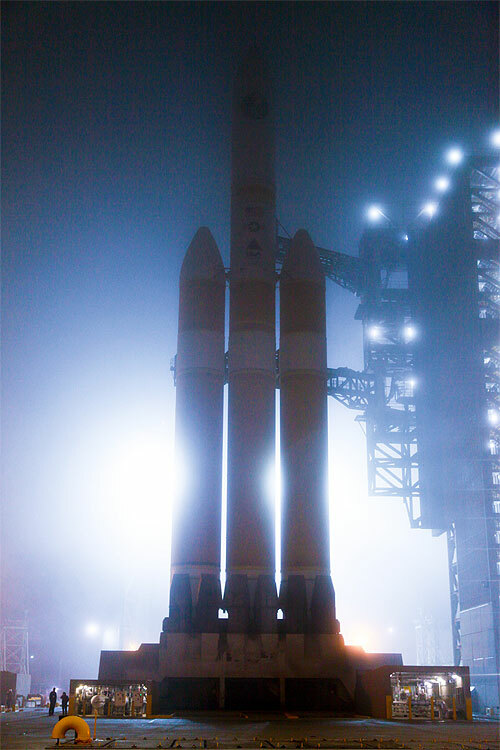 Delta 4 rockets, along with Atlas 5’s, were developed under the Air Force’s Evolved Expendable Launch Vehicle ( EELV) program designed to simplify boosters and reduce costs. 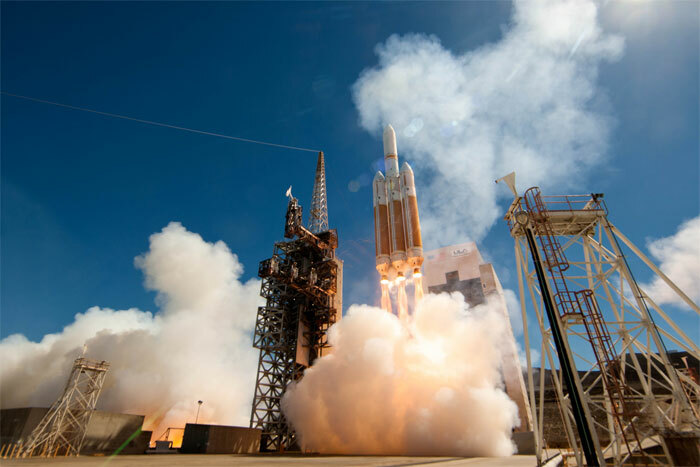 The planned blastoff time for the Delta 4-Heavy rocket from Vandenberg Air Force Base is 10:52 a.m. Wednesday, officials said. The United Launch Alliance rocket will carry a National Reconnaissance Office payload from Space Launch Complex-6. The actual launch window remains classified but reportedly doesn’t extend past noon Wednesday. 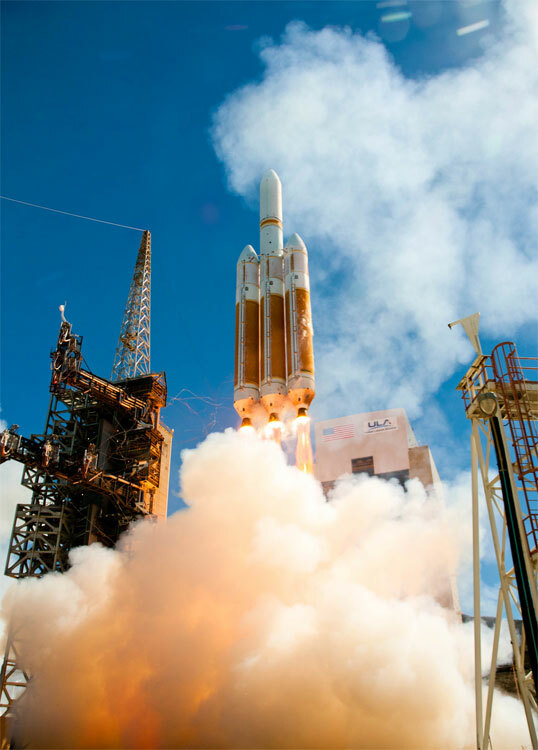 "This will be the second Delta IV-Heavy launched from Vandenberg," said Balts. "We are excited to showcase this national capability for heavy lift on the Western Range in support of the NRO. This is what makes Vandenberg unique because we provide the full spectrum of space lift capabilities from smaller launch vehicles up to and including the Delta 4-Heavy." Igniting its three main engines in a staggered sequence for the first time, a United Launch Alliance Delta 4-Heavy rocket for U.S. national security is scheduled for liftoff from California on Wednesday morning. A new strategy, being employed to reduce the hydrogen flames generated during startup of the three Aerojet Rocketdyne RS-68 main engines, will see the triple-body rocket light one engine two seconds before the other two. Counting down to liftoff at 10:52 a.m. local (1:52 p.m. EDT; 1752 GMT), the Terminal Countdown sequencer will take control at T-minus 10 seconds and the starboard engine begins to ignite at T-minus 7 seconds. Unburned hydrogen is released through the engine and hits the burnoff sparklers beneath the rocket, creating a dramatic fireball around the vehicle's base, something that has become a customary trademark for Delta 4 launches over the past decade. But the new staggered process is designed to lessen that pre-liftoff fire before the 23-story-tall Heavy takes to the sky. With the first engine running and working to aspirate the forthcoming hydrogen flame from the other two boosters, the center and port engines will begin their ignition process at T-minus 5 seconds and see a significant portion of the resulting fire drawn into launch table instead of rising up. The six previous launches of Delta 4-Heavy rockets -- five from Cape Canaveral and one from Vandenberg -- commanded all three engines to ignite simultaneously. The earlier Vandenberg launch in 2011, however, saw the ignition plume catch external insulation on fire as the vehicle lifted off and cleared to the pad. The flames extinguished a few seconds later and the mission proceeded successfully. The staggered engine sequence is meant to prevent such a reoccurrence without altering the engines' operations during flight, providing a cleaner and less dramatic launch. The debut of this procedure on the East Coast will be made next year when a Heavy launches NASA's Orion deep-space capsule on a three-orbit shakedown cruise around the Earth. Each engine guzzles nearly a ton of propellants per second to produce 656,000 pounds of sea-level rated thrust. The upper stage, with its Aerojet Rocketdyne RL10B-2 engine, takes over about six minutes into flight. Wednesday's mission, flying southward from Vandenberg, will place a classified payload into polar orbit for the U.S. National Reconnaissance Office, the agency responsible for operating the country's fleet for spy satellites. 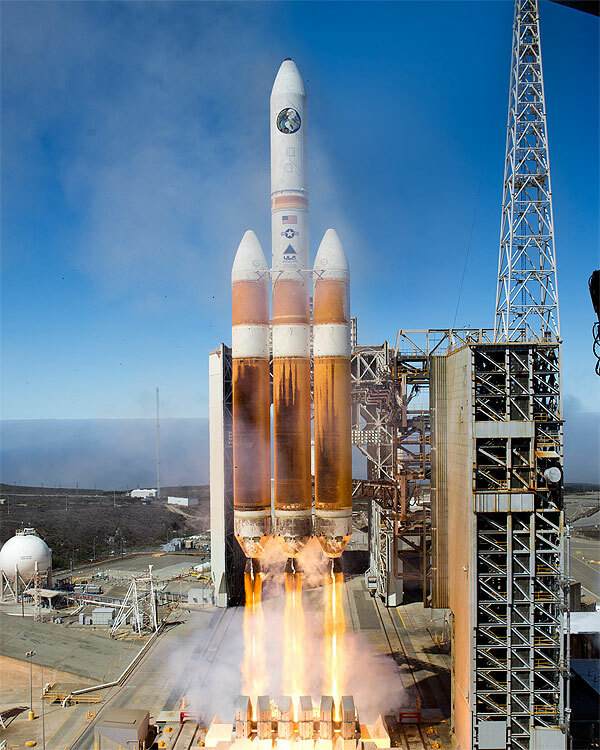 The Delta 4-Heavy is America's largest unmanned rocket currently in service, capable of lofting the biggest and heftiest cargos. The mammoth vehicle is created by taking three Common Booster Cores -- the liquid hydrogen-fueled motor that forms a Delta 4-Medium's first stage -- and strapping them together to form a triple-barrel rocket, and then adding an upper stage. "There's nothing bigger that the United States launches -- period -- in any way, shape or form, and that is absolutely amazing," said Lt. Col. Jim Bodnar, commander of the 4th Space Launch Squadron at Vandenberg. A Heavy launching from Vandenberg is capable of putting school bus-sized reconnaissance observatories into polar orbit, a performance roughly comparable to the retired space shuttles and Titan 4 rockets. The target launch date for this mission, designated NROL-65, has remained unchanged for months, staying on schedule despite sequestration and personnel furloughs. "I don't want to jinx myself, but it has been an extremely smooth flow," Bodnar said. "It is a testament to the work ULA does and that the 4th Space Launch Squadron oversees. I dare say this has been one of the smoothest flows that I've seen." A lengthy series of readiness reviews ranging from subsystems to the payload has been underway since last week. The assessments culminate with the final launch approval to be given Tuesday. "The launch business is probably one of the most risk-adverse businesses out there," Bodnar said. "The extra time the reviews take are well worth the cost because the alternative is unthinkable." Crews at the Space Launch Complex 6 pad, the site formerly envisioned for West Coast space shuttle missions, will retract the mobile assembly shelter to its launch position on Monday. The 9-million-pound structure provides environmentally-friendly working conditions at the pad, originally to avoid high winds during shuttle stacking operations. The 13-million-pound mobile service tower that provides all-level access to the rocket will be wheeled back Tuesday night ahead of the countdown. Clocks will start ticking at 4:52 a.m. local Wednesday, followed a short time later by fueling operations for the eight cryogenic liquid hydrogen and liquid oxygen tanks aboard the vehicle. A planned built-in hold is scheduled at T-minus 4 minutes and will last for 45 minutes, leading to liftoff at 10:52 a.m. local (1:52 p.m. EDT; 1752 GMT). 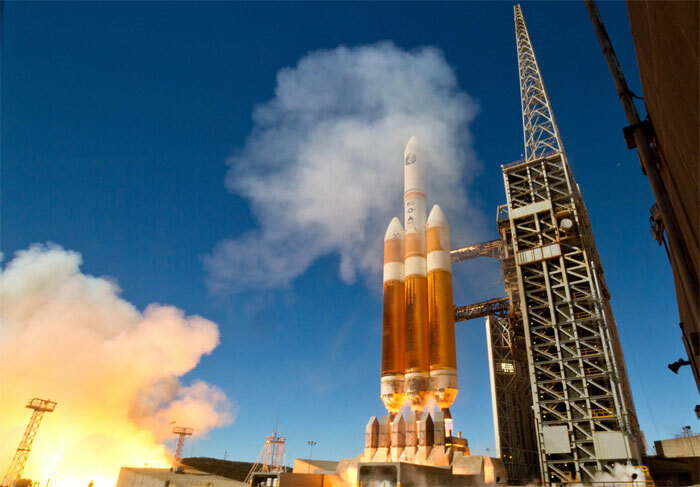 It will be the 364th flight of a Delta rocket, the 24th for the Delta 4 family, the NRO's eighth use of the Delta 4 and ULA's 74th mission, the eighth just this year. "Rarely do you see dry eyes when the rocket launches and you know that it's successful," Bodnar said. "The fact that we actually get to see the fruits of all of that labor is actually amazing. They're awe-inspiring." The nation’s largest rocket is ready to blast off from Vandenberg Air Force Base north of Santa Barbara, carrying a massive, top-secret spy satellite for the federal government. As early as 10:52 a.m. Wednesday, the 235-foot Delta IV Heavy rocket will lift off from the base's Space Launch Complex 6, leaving a thick white plume over the Pacific. The rocket, the tallest ever to be launched from the base, is set to place a classified spacecraft into polar orbit for the National Reconnaissance Office, the covert umbrella agency that operates spy satellites. Southland residents eager to see the blastoff can head to the beaches or the mountains for a glimpse. But it may be difficult to see because it's a daytime launch. Air Force security and local police have closed nearby locations, such as San Miguelito Canyon and Jalama Beach County Park, as a precaution. Although little is publicly known about what exactly the rocket will be carrying into space, analysts say it is probably a $1-billion high-powered spy satellite capable of snapping pictures detailed enough to distinguish the make and model of an automobile hundreds of miles below. 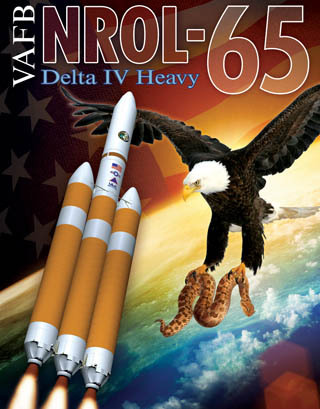 This is the second time that a Delta IV Heavy rocket will be launched from Vandenberg. The first time, in January 2011, a sound wave as loud as a freight train swept over nearby Lompoc, a town of about 43,000. Some people reported hearing the rocket’s roar as far away as 50 miles. Vehicles were pulling off and stopping on the southbound shoulder of U.S. 101 to watch it hurtle into the afternoon sky. The rocket was built by United Launch Alliance, a joint venture of Lockheed Martin Corp. and Boeing Co. It made its maiden flight in 2004 and is capable of lifting payloads of up to 24 tons into low Earth orbit. Three hydrogen-fueled engines — each roughly the size of a pickup truck — will guzzle nearly a ton of propellants per second to provide 17 million horsepower. When the engines do roar to life, more than 200 Aerojet-Rocketdyne engineers and technicians will be watching. It took the company five years to develop the engines at the company's sprawling Canoga Park facility during the 1990s. It was also where the engine parts were fabricated before being assembled in Mississippi. Wednesday’s mission, designated NROL-65, has been on schedule for months. Although Cape Canaveral, Fla., is the launch site for NASA's civilian space program, Vandenberg has been the site of military space projects for more than half a century. Vandenberg, a 98,000-acre base along the Pacific, has been the primary site for launching spy satellites since the beginning of the Cold War because of its ideal location for putting satellites into a north-to-south orbit. Space Launch Complex 6 is known on base as “Slick Six.” The launch pad was built in the 1960s and later was intended to accommodate space shuttle launches, but they remained in Florida. Since then, the pad has gone through many renovations. Most recently, Vandenberg spent $100 million on upgrades over three years.